Here's a question most of us can probably answer, at least approximately: How many hours do you spend in front of your computer every week? But here's a trickier one: How much of that time do you spend doing productive work, and how much of it do you spend watching cat videos? RescueTime ($9 per month) is an online service that tries to answer this question, and sometimes even succeeds. RescueTime's desktop client only reports user activity to the RescueTime website, and doesn't even have its own Settings dialog. To use RescueTime, you need to set up an account and install a tiny client application on your computer. The RescueTime client sits in the system tray (by the clock), and collects information about what you do with your computer. This information can include every window, every document, and every website you access--and it all gets reported to RescueTime for slicing and dicing. There is also an Android app that links to your RescueTime account for tracking time not spent in front of the computer. If you are uncomfortable with that level of detail, you can use the RescueTime Web interface to tell RescueTime not to collect window and document titles, not to collect website URLs, or not to collect email and webmail activity information. You can also switch on a domain whitelist, so that RescueTime only tracks time you spend on a subset of specific websites. 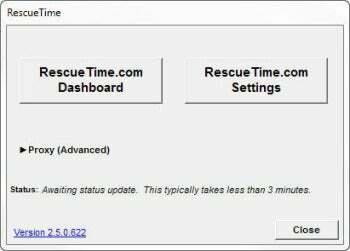 RescueTime also has a setting for ignoring adult websites. With this setting on, RescueTime ignores any adult-related websites you visit (as long as it recognizes them as such). RescueTime works by classifying activities on a scale of -2 (very distracting) to +2 (very productive). It can guess how productive many activities are based on collective data from its user base. For example, it gave my YouTube browsing a -2 score without me having to tell it how distracting YouTube is for me. It doesn't recognize all activities, and you may need to tweak some of those it does recognize (for example, maybe you need YouTube for your work). The RescueTime dashboard tries to give you a bird's-eye view of your work habits, but sometimes ends up being more confusing than helpful. If I had to describe the RescueTime dashboard in a single word, I'd pick "confusing." 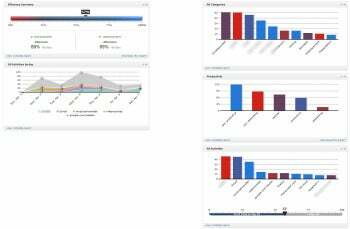 Many Analytics solutions, like Google Analytics, use dashboards, and it often works out great. But the RescueTime dashboard uses some unorthodox graphs, which can be difficult to understand. The "All Activities by day" report is shown as a stacked graph with a hodgepodge of colors, and does not include zooming controls. The Efficiency Summary feature is supposed to show you what time of the day you do best in, but for me, it pinned Afternoon as both the most productive and least productive time. Once you start drilling into the data, you can come up with interesting insights. For example, I can now tell approximately how much time I spend on email every week. And I can tell how long it took me to write a particular review. But even the lower-level reports, such as Activity Detail, leave much to be desired: Even when you view this report By Hour, you still can't tell when you did what. For example, RescueTime can tell me that sometimes between 10 am and 11 am I went to the RescueTime website, and also used WriteMonkey to write this review, but it can't tell me what I did first, nor whether I went back to the RescueTime website after I started writing the review. Having a sequential log of computer activity could provide some important insight, but unfortunately, that's not something you can do with RescueTime. RescueTime's Pro version also offers a Focus feature for blocking distracting websites. You click a button, pick how long you'd like to focus for, and RescueTime makes it impossible for you to access distracting websites for this duration. RescueTime is a neat concept, and a crack at a problem that definitely needs solving: If we could be more focused when we're in front of the computer, we might be able to spend less time "working" and more time enjoying life. Imperfect as it may be, it is still one of the best personal monitoring solutions available today. RescueTime is a Web-based service that lets you monitor how you spend time on your computer.